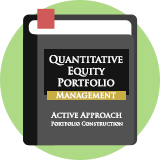 Neglected Firms is a value investing strategy inspired by Ludwig Chincarini and Daehwan Kim in their book, Quantitative Equity Portfolio Management. It uses value and quality measures to find neglected shares that are under-researched by analysts and potentially misunderstood by investors. It looks for companies with low analyst coverage, above average earnings growth and that are cheaply priced according to their price-to-earnings and price-to-book ratios. Chincarini and Kim explain: "It is likely that neglected firm's stock prices do not reflect all the relevant information available and that their prices will react sluggishly to relevant news. This opens a window of time and opportunity for an astute investor to purchase undervalued, neglected stocks and reap the rewards when the market recognizes the stocks' true values." Academic research by Avner Arbel and Paul Strebel found that between 1972 and 1976 comparatively neglected S&P stocks easily outperformed those that were well researched. This book discusses the approach of Bill Miller, manager of Legg Mason Value Trust. He became famous for beating the S&P 500 fifteen years in a row from 1990 to 2005, although his more recent performance has not been as good, due to difficult bets on financials like Bear Stearns, Countrywide, and Freddie Mac.